Here we have a typical underwater	CFWAClose Focus Wide Angle - shots taken with a wide angle or fisheye lens with a dominant close subject (usually strobe-lit) and wide angle background image where the foreground and background were not completely balanced by strobe lighting. 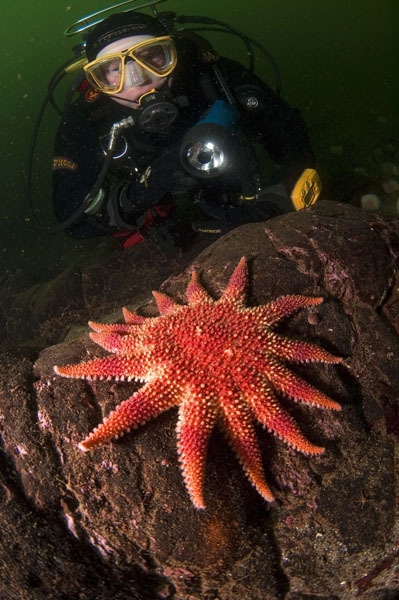 The diver is underexposed and loses detail compared to the starfish, which is correctly exposed. This is a big problem in underwater photography because light falls off so quickly due to being absorbed by the water. The most powerful strobe can only penetrate six feet of water! That's why we often see an imbalance of exposure when you try to light a near and far subject, like here.